check out the great walkthrough and images here. 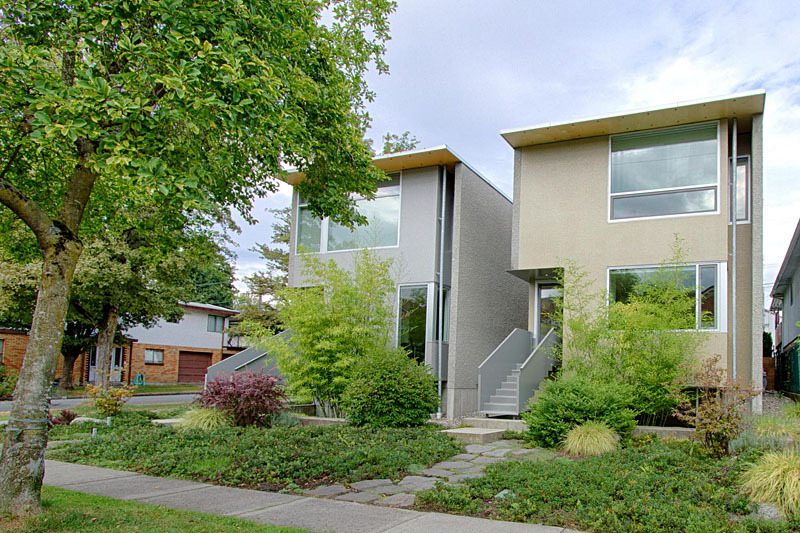 stunning modernist home with zen gardens, meticulously designed by renowned architects battersbyhowat. superbly crafted, efficient to run. open plan main level with oak floors, huge windows, sunken living room (gas fireplace, 5.1 home theater), chic dining, sweeping granite kitchen counters, elegant floating stairs. 3 bedrooms (2 up/1 down) each w/full bathroom. natural light floods every level. across the garden is a stylish studio/office w/retractable wall to divide the space in two. throughout house & studio are custom millwork, cozy underfloor heating, & over 1300 cubic ft of built-in storage w/matt-lacquered doors. west of main, this rare, beautiful property is steps to superb shops, restaurants, schools, hillcrest centre & lovely queen elizabeth park. 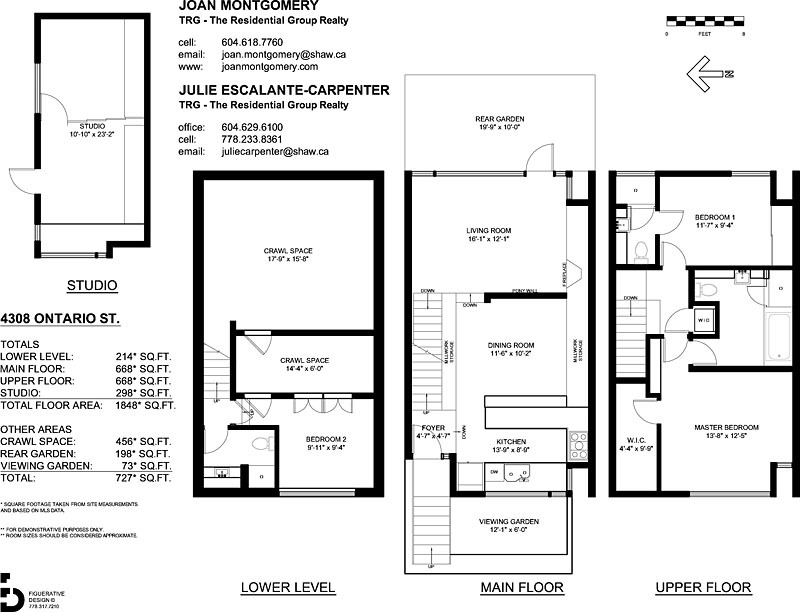 a tight but extremely efficient floor plan utilizing lots of millwork rather than framed walls. steps between rooms create separation while keeping the space visually open. conversion of the garage to a studio is great, now i just need to trade in my ferrari for a ducati. the kitchen is located off the entry. an island with raised backsplash keeps the clutter of the kitchen counter from being visible from the dining area. full height windows from counter allow lots of natural westerly light. the dining area has full height cabinets long one wall that seamlessly blend into the background, and keep the clutter at bay. the living room with built-in fireplace and cabinet. window and door cleverly designed to direct the view to the yard and block glare by reducing height of main window. corner window allows extra natural light and wall extension beyond the windows ensures privacy. tile finish similar to exterior walls is featured above the fireplace. built-in speakers and directional pot-lights reduce the need for extra stereo equipment and free-standing lights. the second bedroom facing the backyard is utilized as a sitting room and has its own ensuite. off-centre window and skylight provide well-balanced natural light. the lower floor has an extra room that could be used as another bedroom. the view from this basement is stunning with a mini zen garden featuring bamboo and vivid groundcovers. the backyard features local plants and thick groundcovers with stone pavers. no hideous lawn here. the garage building has been converted to a studio with a built-in desk the features a view to the yard. the back of the studio has a fold-away wall to close off for an additional room when needed. perfect place to relax, even in such a compact space, a small slice of west coast modernism. How do they achieve the panneled look with the drywall at the seam where the baseboards are? few ways to do this detail. most commonly using ez-strip drywall trim. (architectural f-reveal bead). See buld llc’s blog “3 modern base details“. I have done this detail on a house I designed recently as well. see my detail here.